LOWER EXTREMITY INJURY EVALUATION is designed to reinforce clinical injury evaluation skills beyond the classroom and as a professional reference for practicing Athletic Trainers. 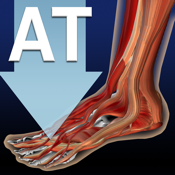 Proper injury evaluation requires extensive knowledge and hands-on experience; this application helps users determine which evaluation to perform based on suspected injury, and provides compelling video of lower extremity evaluation techniques. D. Ligament and Special Tests.